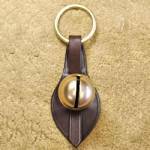 This DIY (do it yourself) kit will allow you to construct a 1-bell door strap using your bell. The final result will be similar to the completed strap shown. This particular design is intended for a single large bell. You will get the best results if you choose a bell that is 2" across (#8 size) or larger with a clear, pleasant sound. The bell shown is a #12 size (2 1/2" across). Overall size of the finished strap will be about 3 inches wide and 11 inches long. The length includes the ring.